I started looking at EzAPI for programmatically creating SSIS packages and I think it's an efficient product to work with. 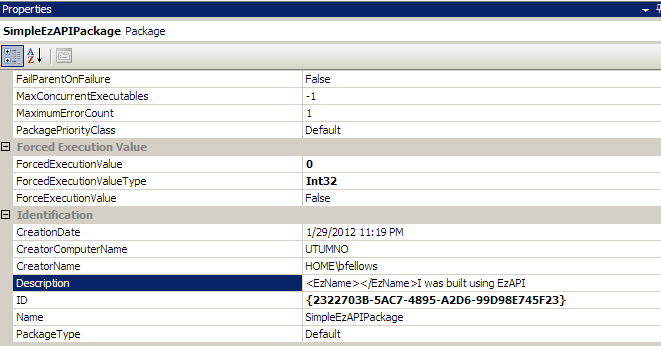 I have built SSIS packages purely through code before and up to a point, it's fun. After that, swimming in the ocean with a bad case of road rash is to be preferred. Pre-reqs are simple, you need to have something that can compile code and the EzAPI assembly. SQL Server 2008 SSIS libraries (C:\Program Files (x86)\Microsoft SQL Server\100\SDK\Assemblies). This might be optional, I have not tried, but it would depend on your usage. Create a new project, I went with Console application as it's my standby. Anything that "runs" will work. Inside that project, add a reference to the following DLLs from the .NET tab. If you don't see those DLL's listed, look at the message that says this list is filtered. No problem, just change the target framework from 4.0 Client profile to the normal one. Right-click on the project and select Properties. 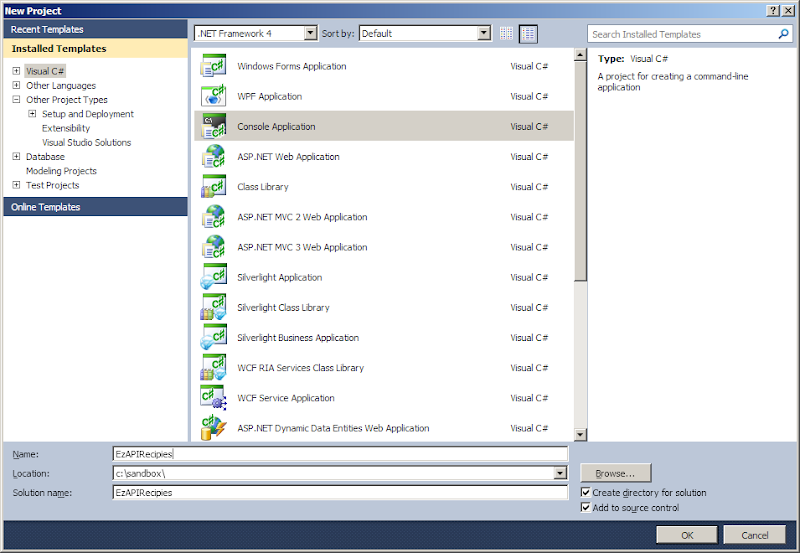 Change the Target framework from ".NET Framework 4 Client Profile" to ".NET Framework 4". If you are not a 64 bit OS, then omit the " (x86)" path in this series. These two articles cover a bit of what they were doing with VS2010 and references but that will be my adventure for another evening. I'm using C# here but any .NET language will suffice. For your first taste of the EzAPI, we'll start dirt simple and create a package that has nothing in it. Yes, be still your beating heart. 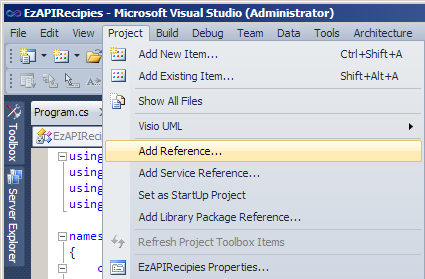 We'll assign two properties as the package level and save to a file. The only thing that is required is to add the EzAPI namespace to our project (Microsoft.SqlServer.SSIS.EzAPI) and then start referencing a bevy of Ez* named classes. On line 36 we declare a variable of type EzPackage and instantiate it on line 38. Lines 41 and 42 we assign values to the properties and on 43 we save the object to a file on disk. Once the code has executed, add the resulting package into a .dtproj and you have created your first package without using BIDS/SSDT. 3:  //     I mention copyright so StyleCop is happy. 21:          /// This is the GO button. One thing you can observe is the values written to those properties. Name has SimpleEzAPIPackage but look at the Description, that's not what we assigned. There are quirks in the library and this is one of them. Finally, you could have simply right-clicked on the project, selected Add new package, clicked Properties and assigned these values but everyone knows that route. Convinced of the cost savings yet? Of course not, tune in to the rest of the series to see cost benefit of using EzAPI. Thank you for all these amazing posts about EzAPI! I really needed to get some basic understanding of how the 'api' was used.